According to app marketing intelligence firm Sensor Tower, the total number of e-commerce mobile app downloads on iOS devices during the 2015 Black Friday week was up by 17%, compared to just 2% during the previous year. Two industries; retail and eCommerce making lots of money and the mobile app seems like the verticle line connecting these two markets. E-Retailers, marketers need to focus on ecommerce mobile app development - That's today's need, it's very IMP for marketers, online retail shopping, web stores & retailers to think, focus on eCommerce mobile applications to optimize retail store for getting customers to engage with the improved user experience for even secure transactions. An eCommerce mobile app isn’t just a basic component of your shopping site now, rather, such a shopping app is a reliable way to build and fight to remain in this rapidly growing retail market competition. The buyers changing their shopping methods and ways fast. They are tending more towards using mobile apps for online shopping and eager to buy whatever they wanted to buy just by clicking few steps on their smartphones. And that is why every online retailer must now tend to ecommerce mobile app development for making a shopping app that will give more chances to reach targeted customers and not only help to engage but increase sales. You can have many ways to reach, communicate and get socialize with all of your customers. These eCommerce mobile apps are now becoming an imporant part in ecommerce businesses to drive extra attention of the online buyers. Because of their business benefits, several mobile app development companies are producing most engaging, interactive mobile apps for ecommerce websites. Furthermore, around 50% of all online retail sales are expected to be done through e-commerce mobile apps by the end of 2018. These numbers go to show that the future of mobile and, indeed, online retail will be in the hands of e-commerce mobile apps. 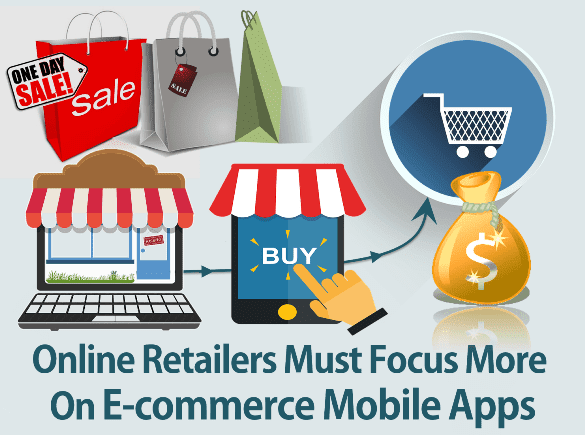 Last time we saw; 7 Actionable Tips For A Better Performing Ecommerce Website and today we are going to see why its very important to all e-retailers or online shoppers must need to think and study about all e-commerce mobile apps that will help them to make more money. While these apps were a superfluous investment in the past, in today’s competitive market, they can prove to be invaluable channels for growth. So why are users flocking to these apps? Users love personalized offers. According to Infosys, 78% of consumers said they’d be willing to purchase from a retailer again if they received tailored offers that related to their needs, wants and interests. An app can easily track purchases and assign special discounts and related offers to your customers, which will inevitably lead to more traffic, improved ROI and a higher conversion rate. In the same survey from Infosys, 86% of customers said they’d be willing to pay up to 25% more for a better experience. This is another great opportunity to use a mobile app to its full potential. By integrating with social media sites, providing an in-app chat option, and offering various ways to improve the shopping experience, you can entice users and create true value for everyone involved. The customer service in a mobile app works in one of two ways: either through a live chat feature or through AI [Artificial Intelligence]. An app can easily integrate a live chat feature that will link customers with retailers and thus speed up the buying process and ensuring that a minimal number of sales are lost. When it comes to AI, mobile apps can trace and analyze customer behavioral data and leverage it to anticipate customer needs ahead of time, thus creating a powerful iteration chain that improves customer service over time almost automatically. When done right, a mobile app should function on a variety of devices, from the smartphone to the tablet, across multiple OS. When this happens, a user can make a purchase on whatever device is handy or track the progress of a sale at various times throughout the day, on different devices. This ultimately has an effect on both individual clients and on your client base as a whole. For example, a client might prefer to purchase from their desktop, while another might prefer to purchase from their smartphone. You want both of them to have an option handy for when they're ready to hit the checkout button. Once installed on a user’s device, a mobile app can be used to increase customer loyalty. Unless the app is uninstalled after a purchase, you can send special offers and discounts through push-notifications to your users, based on the personalization system you've managed to build in your app. This unparalleled access is incredibly valuable, and it cannot be offered by a brick and mortar store, or a website. Many e-commerce businesses, including Amazon and eBay, are spending a considerable amount on in-app promotion. This should come as no surprise, because in-app promotion seems to offer higher conversion rates than newsletter campaigns, according to a study by Responsys. With the features such as reviews, how-to videos, style tips and customer recommendations, apps can drive up conversion rates. E-commerce businesses also routinely offer special discounts to users who install their mobile apps, and to users who purchase through the app instead of the company's website. With the tools and benefits listed above, it's easy to see why. IoT [Internet of things] is changing the landscape of brick & mortar retail stores. With IoT & a mobile app, you can notify customers of special offers when they walk past the store. You can also implement novel features such as mobile payments, stock/inventory updates and push-notifications for items in the user's in-app shopping cart. Mobile shopping apps have tremendous benefits for both customers and companies. Customers seem to love spending time on window shopping within their mobile apps instead of the actual shopping more than they do in traditional stores or physical stores. Companies on the other hands benefit from powerful analytics, higher conversion and retention rates, and better ROI [rate of interest]. It seems that mobile shopping apps are the way of the future. Article By Alfred - is a tech lover who writes for Dot Com Infoway, a multinational digital marketing agency offering SEO, PPC & Social Media marketing to business needs with their expert team. Our Mobile app marketing team provides the best app promotion strategies for your mobile apps, help you design and execute a perfect launch to make your app stand out from other mobile apps in the market.